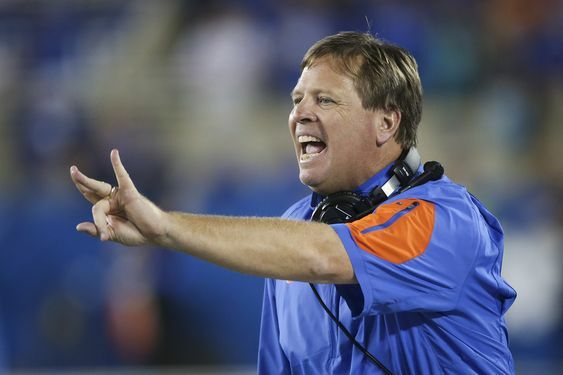 Shirts With Random Triangles: Florida Head Coach Jim McElwain Named SEC 2015 Coach of the Year. Florida Head Coach Jim McElwain Named SEC 2015 Coach of the Year. Jim McElwain. Image via dailyjournal.net. Jim McElwain made quite an impression during his first year as Florida head coach. The SEC named McElwain its SEC Coach of the Year on Wednesday. McElwain led the Gators to a 10-3 overall record, a 7-1 conference record, an SEC East title, and a invitation to the 2016 Citrus Bowl. Two other Florida coaches were named SEC Coach of the Year in their first season in Gainesville. Ray Graves received the title in 1960, and Steve Spurrier did the same in 1990.